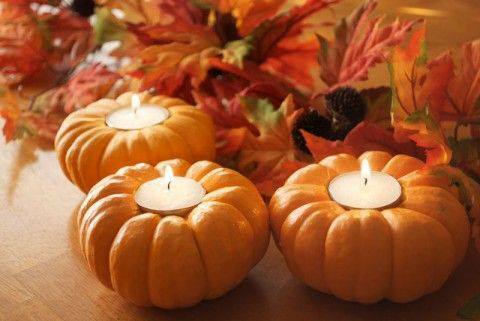 Super creative – just cut the top section out of a small gourd or pumpkin. To do this place tea light candle on top and trace the perimeter with a sharpie marker. Cut just with in this line and you want to be able to push the tea light candle down into hole for a tight fit so it won’t go into the pumpkin or gourd. Also, this would have to be done in a short time before a party or dinner as once cut the pumpkin or gourd will shrink which will make the tea light go into the pumpkin or gourd. This entry was posted in Crafts ~ DIY ~ Projects, ~Halloween, ~Thanksgiving and tagged candle, craft, dinner, DIY, easy, gourd, holder, light, pumpkin, simple, tea, tealight, ~Halloween, ~Party, ~Thanksgiving. Bookmark the permalink.